My last kitchen scraps experiment, growing pineapple tops failed. 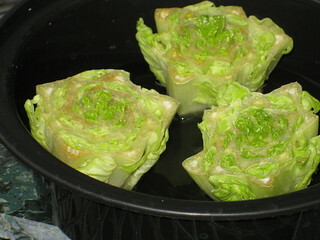 And this is the summary of my romaine lettuce experiment, which I would also conclude as a failure. I found it dried out last night and added water to it. Still, it was looking pretty sad so I took this last photo before I tossed it out. 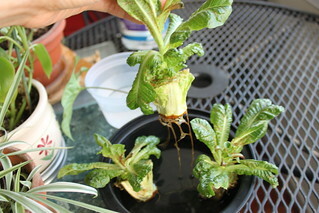 It was growing a pretty healthy root system in the water. I think if I’d added some fertilizer or maybe even something as simple as epsom salts, it might have done better? Either way, it didn’t seem like I was going to grow another head of lettuce big enough to eat.